11 Bridal Nose Rings a.ka. Nath Designs which are a must-see for the 2018 bride! 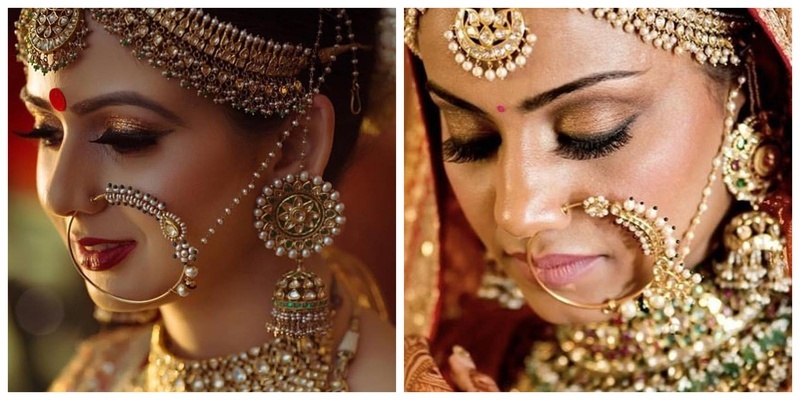 An Indian bride is incomplete without her statement jewellery and heavy lehenga. Bridal jewellery is an integral part of a bride and she wears it with pride. Bridal nath or Nathni is easily an eye catcher. Whether you wear an elaborate or a simple, sophisticated nath, a bridal nose ring will never fail you! Here are some of my favourite bridal nath designs that’ll make you run to a jeweller ASAP! 2. This bride’s huge bridal nose ring is making the headlines everywhere! 3. Simple and light bridal nath design that looks equally pretty! 4. Not a loop, but a small leaf pin. Tedha hai, par accha hai! 5. A bridal nath with a half moon design is a total winner! In case you are a fan of oversized naths too, check out some gorgeous options here! 6. This blush bride’s nath is as beautiful as her! 7. A small hoop with detailed design is equally stunning! 10. *Drumroll* Presenting the best, the heaviest, the most intricate bridal nath my team and I have seen! And here are some more pretty floral naths which you can look at! So which one of these bridal nath designs was your favourite?